Optix Software and its user base have made a significant donation to Vision Care for Homeless People. Trevor Rowley, managing director of Optix, presented a cheque for £6,444 to Elaine Styles, chair of Vision Care for Homeless People, last week at Optrafair. 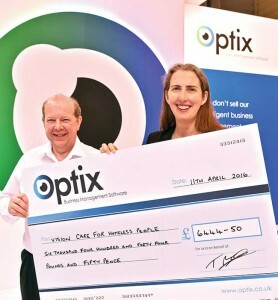 The money was raised from delegate donations made at the recent Optix conference at Celtic Manor and a matched contribution from the UK optical software company. The funds are allocated to support the work of the charity which provides eye examinations and glasses for the homeless at its centres in London, Manchester, Birmingham and Brighton.